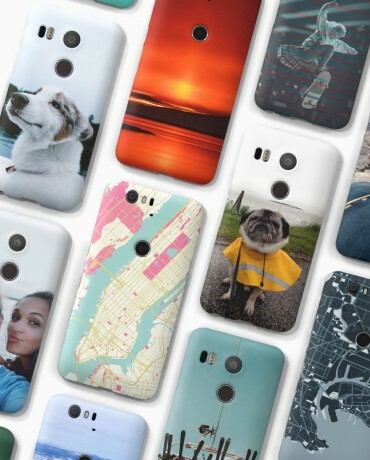 Google today announced Live Cases, a way for Nexus owners to personalize their handset while also protecting it. Interested consumers can upload a photo to Google's site, select a case style, and Google will make the case and ship it. Users can pair the case with a slideshow of related images, if they wish, so the screen and case show the same subject. Users will be able to add more photos to the slideshow at any time. Similarly, the Places Live Case is styled with a map of the person's favorite location. The live wallpaper will show a live map of the person's location as they travel throughout the day. A quick tap will reveal nearby points of interest on Google Maps. Google Live Cases are available to the Nexus 5X, Nexus 6P, and Nexus 6. They cost $35. Google's flagship Android smartphone for the year is the Nexus 6P, made by Huawei. This slim and attractive handset features a metal design, quad HD display, fingerprint sensor, and Android 6.0 Marshmallow. The 5X is just half of Google's new lineup of Nexus phones for 2015. This LG-made handset includes a fingerprint sensor, full HD screen, and 12-megapixel camera. Google revised its Nexus support page and provided more information on how long Nexus-branded phones will receive future software updates. Google says Nexus devices will get Android version updates (Lollipop, Marshmallow, etc.) for at least two years from when the device became available on the Google Store.